Managed to complete this few hours before the end of 2010. Though it took almost a year to complete, I was overwhelmed with the final results and such a relief. 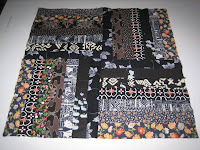 The backing fabric was a simple lantern prints and this quilt measures 88 x 68 inches. Just to wish everyone here, a Happy New Year - 2011!!! Calendar quilt - top completed! It isn't completely finished, but I am really happy to see it put together this much already! 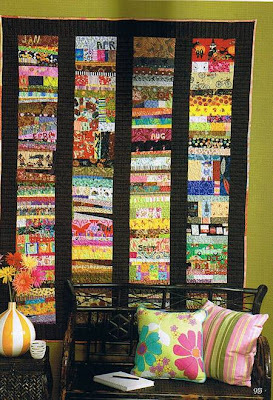 How are your calendar quilts coming along? Happy Happy New Year everyone!! 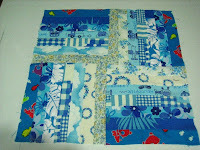 I am so excited to see who has finished a calendar quilt.. yeah you!!! If you didn't finish and still want to continue on in 2010.. and it is SO WORTH doing believe me.. then come on over to my forum topic. I have people starting today.. you can just start on the last day you need to do and continue forward.. it's ok! Here is my quilt and Happy New Year from Pat Sloan!!! there's only one more day in 2009!!! meaning only one more strip to go. 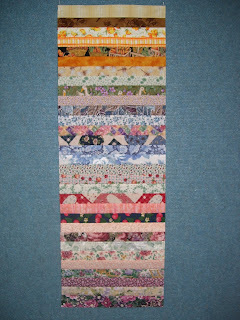 who's gonna be showing us completed quilts in january??? I've been watching eagerly as each month passes by and have enjoyed seeing everyone's beautiful work. Now I can happily present my own November and December ... nothing like doing two months in one but done they are. I was determined to finish before the end of the year. The last four months still require their names to be embroidered so that may or may not happen before December 31 but I'm OK with that. Ta-Da .... the year of 2009 ... one strip for each day. I'm still amazed that I made it! 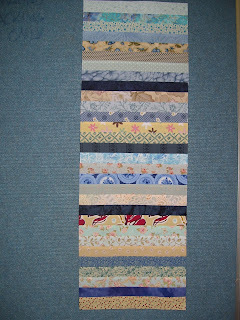 Now for sashings, borders and so on ... but that's for 2010. This is for October, some shades of turquoise.... love them flowing! 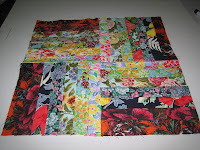 Have collected few fabrics stash with large and gordie floral designs and I arranged them for November. 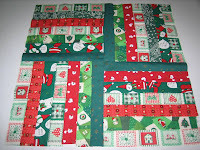 Definitely this one is for December.... even though had not much christmassy fabrics, but somehow it looks merrier blend together. now off to work on putting it all together! This dark block is for September. Now realized that I have a lot of dark fabrics especially black.....being one of my favourite colour. the year is almost done...already!! A lot of orange and black to represent Halloween for this month's block! The year is almost finished! 10 Down ~ 2 to Go! That is .... 10 months completed and November and December to go! 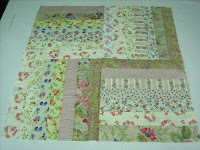 All the fabrics are compliments of a lovely friend who was having a spring clean of her fabric bits and pieces. I'd like to embroider all the family birthdates etc, so that might be my challenge for 2010. Wow, already 3/4's of the year have come and gone. I still can't believe that I've managed to keep up. At the beginning of the year I had good intentions to stay in time, but often life takes over. So I am pleasantly surprised to present the month of September. A number of these were fat 1/4's I received as part of a Birthday Swap ... some from my daughter for Xmas, Birthday and Mother's Day ... one as a prize ... and a few others. 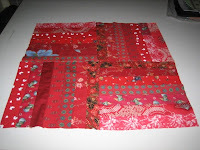 I'm really enjoying the making of this quilt. How is everyone else coming along? Thankyou Rachel for planting the seed. please take this button to promote our challenge. pat sloan's favorite techniques book.